One of the biggest staples of my fridge is a ready batch of mustard lentil salad. It’s good by itself but is even better scooped onto a large bed of lettuce with some feta, croutons, and a hard boiled egg. One of the biggest blessings of this recipe, aside from being very easy, is that it is high in protein and reasonably low in fat. Fresh parsley is an amazing accompaniment to lentils for flavor and for it’s vitamins, minerals, and the digestive qualities it offers. I always keep fresh parsley growing in my yard just for this recipe. In a pot big enough to cook two cups dried lentils heat up the olive oil on med/high heat. Add the onions, saute until they start turning transparent, then add the celery and carrot. Saute all the vegetables for five minutes before adding the lentils and covering with water to about an inch above the lentils. Turn the heat down to low and simmer for as long as it takes for the lentils to be cooked through perfectly, usually between 2o minutes to a half an hour. If there is any water left at the bottom of the pan, drain the lentils in a colander and return to the pot, but not to the stove. In a container that will accommodate an immersion blender add all of the dressing ingredients. Then pulverize it until it is thick. Add to the lentils and stir well. You can eat the lentils at room temperature, hot, or cold. I nearly always eat it cold as a salad. If you are eating it by itself it obviously needs no dressing, but when I put it on a bed of lettuce I add some dressing to the greens. You can cut down on fat by not doing this but I like a well oiled salad. Plus I like fat. How I serve it: I put a big bed of lettuce on a dinner plate. I put about a cup of the lentils scooped onto the top. 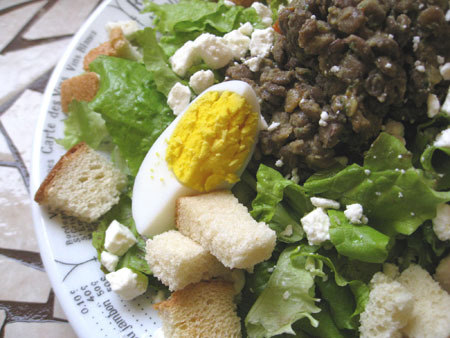 I add a sliced boiled egg, about a half a cup of croutons (when I’m being conscious, or about a cup when I’m not minding my manners and my waist), and about an ounce and a half of feta cheese. This is a filling and very wholesome lunch or dinner. It includes protein, dairy, legumes, greens, grains, and a whole heck of a lot of vitamins and minerals. As far as calories are concerned I know that eating it as I often do will land you around 700 calories. If the rest of the food you eat in the day is leaner and smart I think the calories here are very well spent. This entry was posted in Pantry Cooking on May 3, 2009 by angelina.